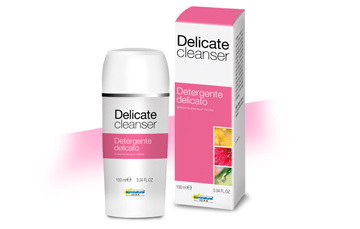 An extemely delicate cleanser enriched with the plant extracts of rice and almonds, ideal for adults and children daily hygiene. It releases emollient and hydrating substances and contrasts skin dryness, and in particular Thymus vulgaris extract, with natural antibacterial properties, in sinergy with the natural hydrating phytocomplex (marshmallow, flax seeds, and almonds), effectively and actively prevents the onset of irritation in the skin and mucous membranes. Enriched with Iceland Moss, with considerable antimicrobial properties, it performs a protective and decongestant activity for the mucous membranes. Enriched with Iceland Moss, with considerable antimicrobial properties, it performs a protective and decongestant activity for the mucous membranes. Specifically formulated at PH 5.5, which brings the acidity of the skin to normal levels promoting the restoration of natural physiological defences. Use the product as your normal cleanser every day during your hygiene operations.